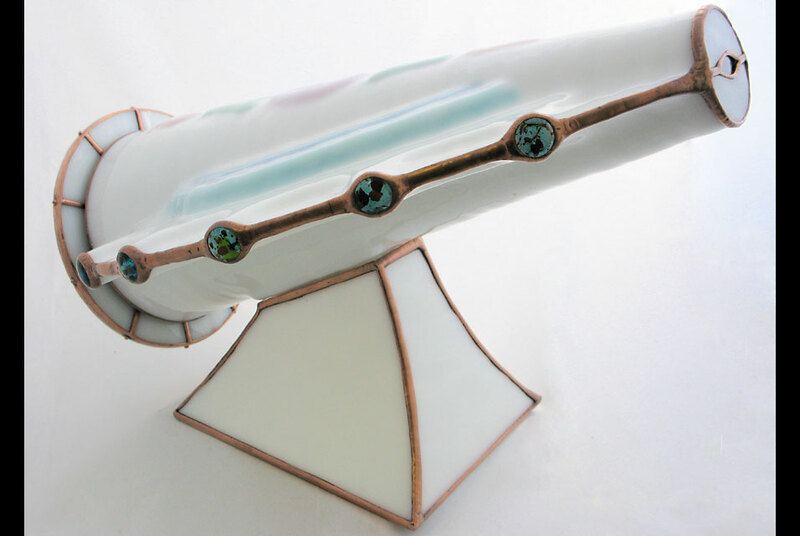 Charles Karadimos, Odyssey, 2009, slumped glass exterior, copper foil construction and front surface mirror; object case with fused, slumped and lampworked glass, 11 x 12 x 16 in., Collection of the artist. AKRON, OH.- For internationally renowned quiltmaker Paula Nadelstern, the word kaleidoscope promises surprise and magic, change and chance. The Akron Art Museum is the only Midwest venue for this stunning exhibition, which places Nadelsterns quilts within an historical context for the first time. Whether your interest is art or science, you will be dazzled by the luminous colors and breathtakingly intricate patterns of Nadelsteins quilts, says Barbara Tannenbaum, the museums director of curatorial affairs, and amazed by the historical and contemporary intersections between the two fields. Installed in the museums Karl and Bertl Arnstein Galleries, two rare early kaleidoscopes and an extraordinary early 19th century star pattern quilt will be joined by 19 contemporary quilts and 12 kaleidoscope quilt blocks by Paula Nadelstern and 5 contemporary kaleidoscopes by eminent artists from around the country. Nadelstern has spent over two decades capturing the excitement of color, pattern, light and texture of kaleidoscope images in her quilts. Her initial inspiration was the bilaterally symmetrical design on a bolt of Liberty of London fabric. This type of design was unimagined before the invention of the kaleidoscope in 1816 by Scottish physicist Sir David Brewster. The device reached American shores by 1818 but not until the 1870s were significant refinements made by Charles G. Bush. The kaleidoscopes crystal-cut angles, brilliant colors and dizzying reflections had an enormous impact on the decorative arts, bringing a new dynamism into domestic interiors through personalized quilted expressions that represented a revolution in quilt design. Starting in the late 1970s, kaleidoscopes developed into an important new art form as part of an unprecedented craft renaissance. Momentum increased in the 1980s with an article in the November 1982 issue of Smithsonian Magazine, followed by the publication in 1985 of the first history of kaleidoscopes, Through the Kaleidoscope by Cozy Baker. Five contemporary kaleidoscopes by renowned scope makers will be installed alongside Nadelsterns quilts. Visitors will be encouraged to look through these contemporary scopes into the world of color, pattern, light and texture. The potential of the kaleidoscopic image as a design source for carpets, wallpapers and other decorative applications was immediately recognized. The dazzling abstraction of the imagery had a particularly profound effect on quilt making, as evidenced by early nineteenth-century quilts such as the historic star quilt in this exhibition. While Nadelstern honors this legacy, she has created an entirely new idiom in the art of the quilt that amazes, delights and inspires. Nadelstern's first quilt was stitched in 1968 for her bed in her college dorm room. It was not until 1987 that her interest in all things kaleidoscopic was sparked. Focusing on the kaleidoscopic quality in the symmetry, she developed new techniques and an intricate and distinctive personal aesthetic that has yielded a seemingly infinite vein of creative expression. Nadelstern has achieved international recognition, including being the first living artist to have a solo show at the American Folk Art Museum and inclusion in the Twentieth Centurys 100 Best American Quilts. Her designs have inspired industrial products including carpet in the Hilton Americas hotel in Houston, TX. Paula Nadelstern (b. 1951) is a native New Yorker, born and raised in the Bronx. The two-bedroom apartment she shares with her husband and, until recently, her daughter has also served as her studio for more than twenty years. She is the author of Paula Nadelstern's Kaleidoscope Quilts: An Artist's Journey Continues, Kaleidoscope Quilts: The Workbook, Puzzle Quilts: Simple Blocks, Complex Fabric, Kaleidoscopes & Quilts and Snowflakes & Quilts. Nadelstern was the recipient of fellowships from the New York Foundation for the Arts in 1995 and 2001. She designs textile prints exclusively for Benartex, Inc. and travels extensively teaching her unique kaleidoscopic quiltmaking techniques.